Working with nature allows us to experience its natural cycle each year. Vines awaken from their rest in spring to grow and produce fruit until the next winter when they go to back to sleep, only to be reborn again. Our Circle of Life collection is inspired by this ongoing cycle that exists not only through the biodynamic and organic farming practices implemented at Waterkloof, but also in life in general. At Waterkloof we strive to produce the finest grapes by adhering to traditional organic and biodynamic methods. Our methods are based on Old World, sustainable practices in our vineyards to ensure that the vines are nourished, healthy and in balance. Our soils are free of chemicals and are kept healthy by using plant extracts, fungi and bacteria from our own organic compost. We do not spray any chemicals in our vineyards. Our focus is to find natural alternatives and to produce our own compost to ensure soil that is full of life, rich in oxygen and brimming with different insects. We want to be able to smell the soil. Our aim has always been to get a better understanding of Waterkloof and the individual characters of its vineyards. This elegant wine is the culmination of a unique set of circumstances emanating from site-specific vineyard blocks perched high on the slopes of the Schapenberg that have shaped the components in this blend. 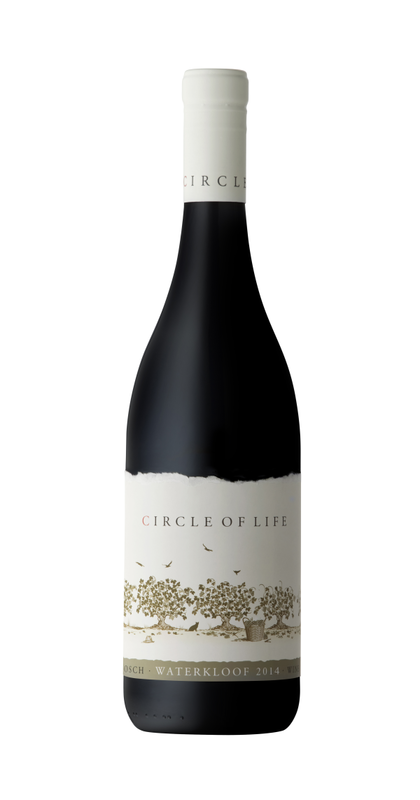 Our Circle of Life Red is not a wine that is driven by a particular varietal or a specific parcel of a vineyard, nor constrained by a traditional blending style, for example a Bordeaux or Rhône blend, but rather an elegant expression of the philosophy and totality of Waterkloof, as well as the vintage. We harvest according to taste and find it essential to spend a lot of time in the vineyards to see how the flavours develop. All grapes were hand-picked and brought to the cellar by our horses. To ensure that only the best berries are used, we sorted all grapes by hand. It was then placed into our wooden fermenters via our gravity system. The Rhône varietals were whole-bunch fermented and the Bordeaux varietals were destemmed. The fermentation started naturally with yeast present on the grapes to enhance the flavours prevailing in the vineyards. Throughout the fermentation process we did soft punch downs twice a day to gently and slowly extract the tannins. The wines spent around 30 days on the skins during which the tannins were able to soften. After the maceration time on the skins we ran the wine down via gravity – still no pumping. The grape skins also fell through, into the basket press and were softly pressed to gently extract the last bit of wine, aroma and colour from the skins. The varietals were aged separately in French oak. 600L Barrels for the Rhône varietals and 225L barrels for the Bordeaux varietals. Only 20% were new barrels to avoid dominance of wood aromatics in our wines. After 18 months in barrel we blended the Syrah (56%), Merlot (17%), and Petit Verdot (27%) together and kept it for another year in our wooden fermenters. This wine is unfined and gently filtered. Winter sets up a strong foundation for the rest of the seasons to follow. It prepares the vines for the coming growing season and its effects can be felt throughout. Cold weather conditions during the early part of winter allowed for even bud break during spring. We did however experience an earlier than normal bud burst due to rising winter temperatures at the end of the season. Rainfall was very low during the winter period, which is always a challenge in areas where we rely on winter rains to replenish our dam and groundwater levels. A perfectly integrated blend with great length that combines the spiciness of the Syrah, the fresh fruits of the Petit Verdot and the juiciness from the Merlot. The beginning is fresh and fruity with good acidity, evolving into riper flavours and herbaceous notes, with elegant tannins and light acids in the finish. It is very versatile and will complement numerous dishes from a tomato based stew to meat on the bone.